One of the drawbacks with long-distance learning is that it’s really easy to overlook the obvious. 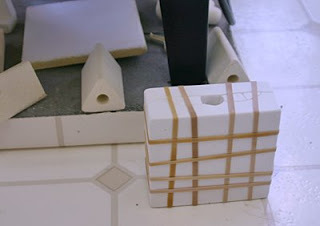 For those of us who work in slipcast ceramics, there are a number of things we just take for granted because we deal with them on a constant basis. An email message from someone struggling with mold-making reminded me of this. 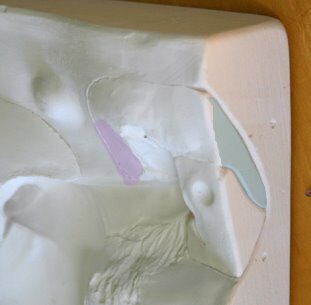 Probably the most common problem I’ve seen among people attempting to make their first molds is something as simple as using the wrong plaster. 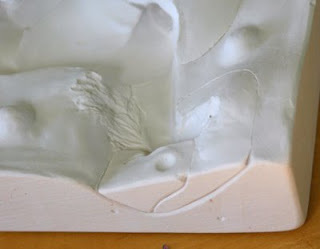 I know in this blog I use the generic term plaster, as do most ceramists when they are talking about making molds. The problem is that we aren’t actually using generic plaster. Ceramic molds – at least the kind used for detailed eathernware castings – are made from a special kind of plaster called “Pottery Plaster No.1“. Using the ordinary plaster available at the local building supply store leads to a lot of frustration. I’ve learned that when someone calls me to say they are having trouble, I need to ask what kind of plaster was purchased. Pottery Plaster No. 1 is made for this kind of work, but it’s also really finicky. If it gets damp it tends to clump, which ruins it. 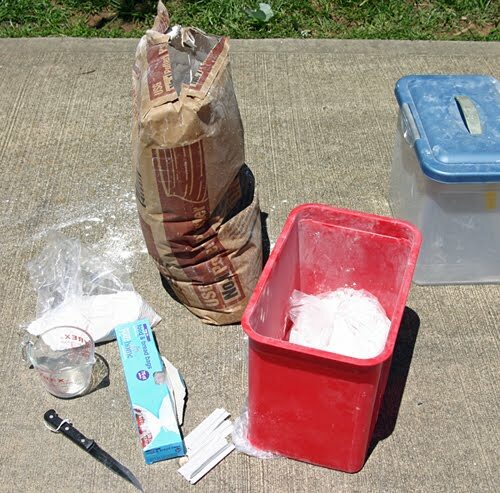 Molds made with clumpy plaster rarely turn out well. Living in the southeast, I end up losing a lot of plaster to humidity. 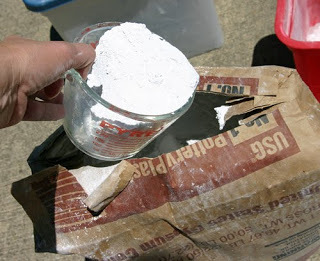 I try to minimize this by dividing the plaster into smaller portions which are kept in plastic bags that are then stored in a sealed plastic container. I’ve found that one 50 lb. bag of plaster fits pretty comfortably in two document-holder plastic containers. This way I can pull out just enough plaster for a job, without exposing the rest to the air. As you can see, I have this set up on a paved driveway. It is important not to let the plaster dust contaminate the clay, and this kind of work is pretty dusty. I like to keep it as far from the studio as possible. 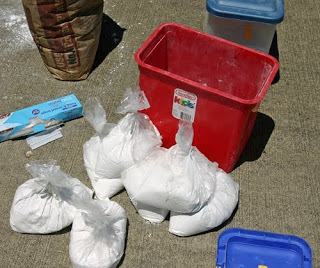 I’ve often wondered what my neighbors think as I make up dozens of bags of white powder, but so far none have asked! This the watched pot that won’t boil. 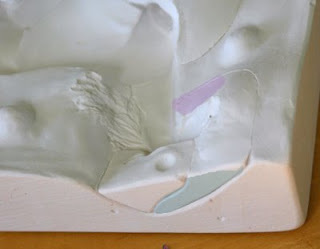 That’s the mold that will tell me if Vixen can be cast in one piece. I’ve placed it next to the kiln (which has been running pretty steadily for the last few days) hoping that it will dry faster. So far the only thing drying have been the rubber bands! I almost forgot to mention that I found another use for the large gauge veterinary needles. One of the things I wanted to try with this test mold was pouring the head piece. 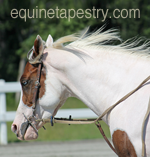 Horses with turned heads are problematic in ceramic, and usually require a separate piece to fit over one side of the head and neck. “Finn” has one of these. In the past I’ve made these by hand, much like I did with the tail piece for “Imp”. I thought with “Vixen” I would try to include this piece in the master mold, and pour it just like the others. The problem with pouring these kinds of pieces is that they wrap under the original. The poll piece sits on top of the ears and forehead, but the second piece has to include the underside of the head. Since the plaster pours from the top (the area tinted blue), what often happens is that some amount of air – often quite a lot! – will get trapped under the jaw (the area tinted lavender). What I found was that I could fill the needles with newly mixed plaster, tip the mold sideways like I have in this picture, and then insert the needle just past the tip of her nose. I measured that distance and marked the needle, since the last thing I wanted to do was inject plaster into the rubber! But doing it this way allowed me to fill the area under the jaw. Then I turned the mold back the normal way and continued filling the rest of the cavity. The finished plaster piece was completely bubble-free. The nice thing was that plaster cures slowly, so the needle can be cleaned and used again. With the rubber the syringes have to be thrown away since it is impossible to clean them afterwards. So I have the marked needle ready to use again for future plasters, if this mold design works. In the meantime, I’ve reclaimed my studio and have started glazing again. It feels good to get back to all the projects I left hanging when I started working on the molds. I’ve enjoyed pushing myself with some more complex molds, but the end results aren’t nearly as charming as finished, shiny horses!